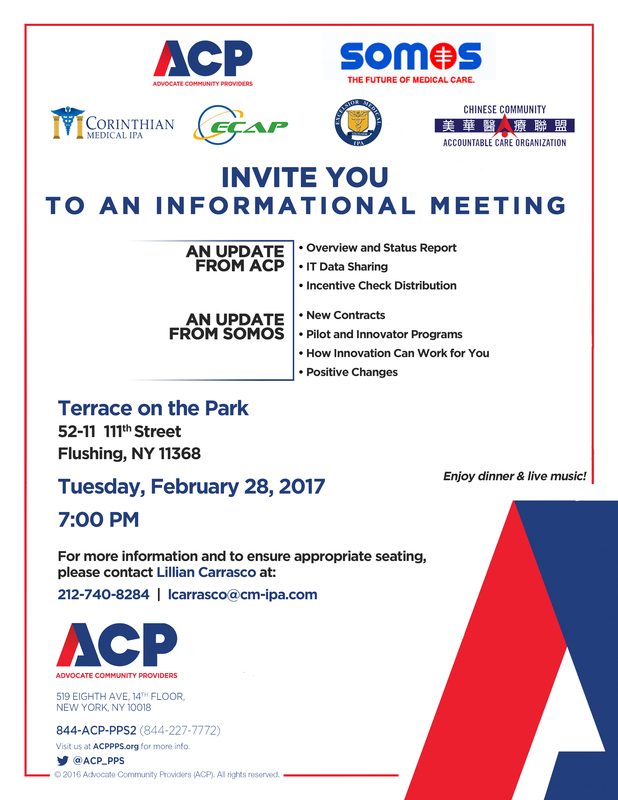 ACP, SOMOS and CCACO would like to invite you to an informational meeting with updates from ACP and SOMOS. ACP staff will be giving a general operations update and a review of IT data sharing and incentive check distribution. Please contact Lillian Carrasco at 212-740-8284 or lcarrasco@cm-ipa.com to RSVP. On Wednesday, September 14, 2016, CCACO held a press conference at the Wyndham Garden Chinatown to announce that it had earned $4.3 million in shared savings through the Medicare Shared Savings Program. Dr. Henry Chen, CEO, and Dana Zhu, COO, discussed CCACO's achievement and its unique approach to low cost, high quality, community-based care. CCACO ranks second among all 35 New York State accountable care organizations (ACOs), and in the top 5% of all ACOs nationwide, for percentage of expenditures saved in 2015. The press conference was also attended by Assembly Member David Weprin, Assembly Member Felix Ortiz, and a representative from the office of Congresswoman Grace Meng. Assembly Members Weprin and Ortiz lauded CCACO and its physicians for their success in caring for the New York City Chinese community and presented proclamations honoring CCACO's achievement. CCACO also received proclamations from Congresswoman Meng, Council Member Barry S. Grodenchik, Council Member Peter Koo, and Manhattan Borough President Gale A. Brewer. Community partners Eastern Chinese American Physicians (ECAP), Advocate Community Providers (ACP), MDLand, and the Visiting Nurse Service of New York (VNSNY) were also in attendance to offer their congratulations. We would like to thank all CCACO Board members and physicians for making this event a success and continuing to provide excellent care every day to the Chinese community. Please see below the news articles from The China Press, Sing Tao and World Journal. Please click HERE for The China Press article. Please click HERE for the Sing Tao article. Please click HERE for the World Journal article. Medicare ACOs are groups of doctors, hospitals, and other health care providers, who come together voluntarily to provide coordinated high quality care to their Medicare patients. The goal of coordinated care is to ensure that patients, especially the chronically ill, get the right care at the right time, while avoiding unnecessary duplication of services and preventing medical errors. When an ACO exceeds quality and financial thresholds – demonstrating achievement of high-quality care and wiser spending of health care dollars – it is able to share in the savings generated for Medicare. CCACO is one of the ACOs that shared savings. Nationwide, CCACO ranked in the top 5% of all 392 ACOs nationwide for percentage of expenditures saved over benchmark, saving 11.02% ($10.3 million) over its benchmark and earning a shared savings payment of $4.3 million. Out of the 35 ACOs with beneficiaries in New York State, only eight earned shared savings. CCACO ranked second among all New York State ACOs. We are deeply proud to be sharing this news with you and thank you for the hard work and dedication you have put in to make this achievement possible. CCACO invites you to join the growing trend of practices across the country and transform your practice to become an NCQA Patient Centered Medical Home (PCMH). PCMH is a PCP-centered primary care and transformation model aimed at providing coordinated care among healthcare providers. PCMH also aligns with the Three Part Aim of an accountable care organization (ACO) - improving the patient experience, providing coordinated care and decreasing costs. Applicants must submit documentation satisfying the PCMH requirements of enhanced access, population management, planned and coordinated care, patient self-care support, and quality improvement. Level II and Level III Recognized practices will receive significant financial incentives. Please see the chart below for details. Click here for more information about the PCMH program from the National Committee for Quality Assurance. If you are interested in becoming a Patient Centered Medical Home, please contact Winsley Tam at wtam@ccac.org or 212-965-0222.